Did you know that by training Muay Thai you will be able to experience all sorts of positive changes in your life? That’s right, it’s up to you to begin training in order to see them and experience them yourself. 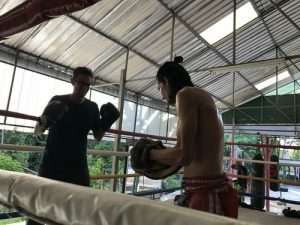 If you read this article, you will learn just about enough in order to wet your appetite and hit the Muay Thai gym nearby. That being said, once you don your Muay Thai gloves, things may not seem as easy as you have made them out to be initially. You will have to work hard – it’s in the nature of the world of martial arts. We can’t really imagine you becoming a proficient martial artist unless you work hard at it for a long period of time. But whoever you are, and wherever you come from, you can succeed in improving your Muay Thai skills and becoming a part of the elite of Muay Thai. It may take months – it may take years, but if you’re persistent at it, you will eventually succeed. But there are many benefits that you will experience along the way to becoming a proficient Muay Thai fighter. First of all, you will learn how to fight – this is a no-brainer. The fact of the matter is that many people are afraid of getting in contact with any form of physical violence whatsoever. Well, if you begin training Muay Thai, you will come to see that you gain courage. Also, you will experience a dramatic improvement of the state of your personal fitness and your health. You’ll lose weight and get shredded in the process. So, we hope that you will find it a pleasure to start training Muay Thai, no matter who you are. And the best thing about it is that Muay Thai is a highly popular martial art. It means that you will be able to find training camps all around the world. Chances are that there is a Muay Thai training camp in the area where you live. Make sure that you get there and try training Muay Thai for a few classes initially. See if you like it. We know that you will.